Maire, born in Paris in the Marais neighborhood, became known as a “peintre- voyageur” (“painter-traveler”). He was a pupil of André Devambez at the École des Beaux-Arts in Paris and also of Émile Bernard, who was a great influence on his life and art. In 1917 he was drafted into the French Army. He served in Indochina and while doing his military duty, also taught drawing at the French Lycée in Saigon. He made a number of trips to the temples of Angkor which he often painted. In 1922, Maire married Bernard’s daughter, Irène. 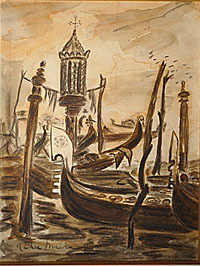 During his long life he also lived and painted in Italy, Egypt, India, Ceylon, and Africa, and is well known for his depictions of these far-flung places. An exhibition of his drawings of Africa and Asia was held at the Musée des Années 30 in Boulogne-Billancourt in 2001. His work is found in the permanent collection of that museum, as well as in the Musée du Quai Branly in Paris. In 1922, Maire traveled to Italy with his mentor, friend, and father-in-law, Emile Bernard. 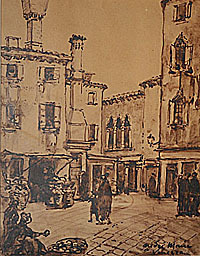 After touring and studying art in a number of Italian cities, they settled in Venice and opened a small gallery/ studio on the Campo delle Gatte. It was during this sojourn that Maire made these drawings. André Maire, Peintre Voyageur, 1899-1984, Emmanuel Bréon, editor, Somogy Éditions D’Art, Paris, 2000..... André Maire, Dessins d’Afrique et d’Asie, Catalogue of the Exhibition, Michèle Lefrançois, Curator, Musée des Années 30, Boulogne-Billancourt, France and Somogy Editions d’Art, Paris, 2001..... E. Bénézit, Dictionnaire Critique et Documentaire des Peintres, Sculpteurs, Dessinateurs et Graveurs, Gründ, Paris, 1999.... de Ménonville, Corinne, La Peinture Vietnamienne : Une Aventure Entre Tradition et Modernité, Les Editions d’Art et d’Histoire, Paris, 2003.